The upcoming election to decide the next U.S. commander-in-chief is going to be a tight race. Most polls show a slight lead for President Obama, which is practically a tie with the margin of error. The tide, however, appears to be shifting after the two met for their first televised debate. Romney brought his A-game and was clear and concise in explaining exactly what he would do to fix the economy and get Americans back to work. The president on the other hand, fumbled his words and looked absolutely unprepared. This came as somewhat of a surprise as Obama is normally known as being a great orator. Polls of likely voters following the debate show that it is now Romney who holds a slight lead with 46 percent over Obama’s 45 percent. Due to poll numbers being so close, the outcome of the race will depend on independent voters who currently favor Romney by a percentage of 44 to 32. The president and governor both have opposing views over how they will handle the economy and lower the unemployment rate. They also disagree on foreign affairs. The president wishes to cut spending on military defense and has also been very vague over his stance with Iran. He has consistently been criticized by Prime Minister Benyamin Netanyahu for not taking a tougher position over Iran’s nuclear program. When it comes to the Jewish vote, however, Jews have traditionally voted democrat. AJC, a non-partisan Jewish advocacy group, shows that Jewish voters favor Obama by a percentage of 65 to 24. 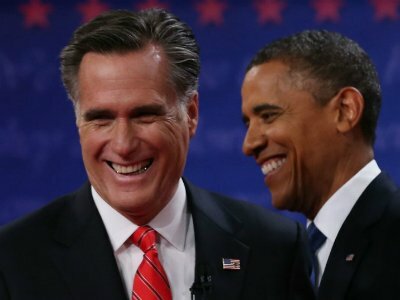 The debate has certainly won Romney some favorable views among the public with 52 percent saying they have a positive view of him, as opposed to 48 percent prior to the debate. This is the first time the governor accumulated a favorable view rating of over 50 percent and also the first time he leads Obama.